Background: Capsules containing a dye were prepared by the LbL method with iron oxide nanoparticles (50 nm) in different layers of the shell. Method: The capsules were dispersed in a gel and subjected to focused ultrasonic irradiation at three different powers and exposure times. 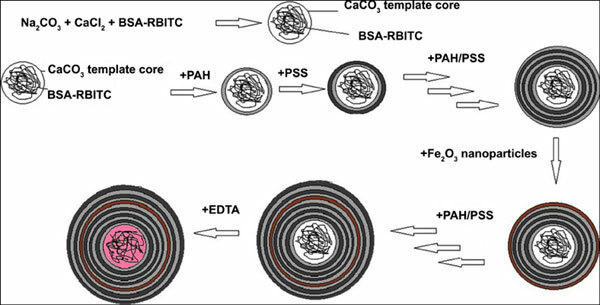 Result: It was found that the inclusion of iron oxide magnetic nanoparticles in any of the polyelectrolyte shells (4, 6, 8 and 10) strengthened the capsules with respect to capsules without nanoparticles. Incorporation of nanoparticles in shell 8 provided the most resistance to fragmentation under focused ultrasonic irradiation. The relative degree of capsule stability is dependent on both the power of the ultrasound and the exposure time. Conclusion: The presence of iron oxide nanoparticles not only conferred more resistance to fragmentation but also provided a route to protein labelled dye release through sonoporation that was not present for capsules without nanoparticles. Microencapsulation, nanoparticles, ultrasound, controlled release, targeted drug delivery, fragmentation.